I can’t quite remember there ever being this much furore about the release of a web browser. Together with a large number of blogs mentioning the release of Google’s new Chrome browser, the BBC and Sky have carried large reports on their news programmes, and people at work, unconcerned with IE8 or Firefox 3 releases, have asked me about it. Even my wife, who normally couldn’t give a hoot about web browsers, has mentioned it. So, I downloaded and installed it. Here I present a first impression, or two. I didn’t even know about Chrome until a day or so before its release. Once considered the David in the classic bible story, Google now seems to be amassing quite an armoury in its assault of Goliath Microsoft. Some people are now concerned that its very qualities as a rising star have now morphed into those of a Microsoft that they have always despised. They want to own the Internet, and I find that neither surprising or unconventional. So, beyond the discussion of monopolies and competition, honour and integrity, let’s have a look at the browser itself. To download the install package was less than 500k, but to download the main install took an age. I wonder how big the main install package is? Currently, it’s only available for Windows machines, but a Mac and Linux version is on the cards. Chrome’s tabbed browsing is nothing new, but each tab runs in its own process, so theoretically, a typical browser crash results only in a ‘crashed tab’, allowing you to close just the tab and carry on seamlessly. A welcome feature. I’ve had to end the firefox process countless times because a page on a particular tab has caused a terminal problem. Doing a Control + F (find on page) doesn’t overlap the page with a modeless dialog (like IE), but merges the dialog with menu bar at the top right of the main window. If text is found on the page, it is highlighted, like Safari. If the text is found, the number of occurrences is shown on the dialog. The particular occurrence (say, 1 of 3) is highlighted in orange, and others are highlighted in yellow. A useful feature. Opera’s ‘Speed Dial’ has been reproduced, but the sites shown are those that you have visited most often. Hmm… a useful feature methinks. One of the main reasons I love Firefox is its extensions, particularly the web developer toolbar and Firebug. Right-clicking on a page and selecting ‘Inspect Element’ provides a poor-man’s Firebug. It’s early days, but it’s there. However, this is the tip of the iceberg. Chrome provides ‘Gears‘, an effort aimed at developers, and allowing for the browser to be extended. Quite how this will pan out remains to be seen, but I’m sure well see some good things coming from the Gears initiative. Chrome uses Webkit for its rendering engine, so if you’ve been using Web Standards and your sites look good on Safari, Firefox and Opera, you’ll have no issues. 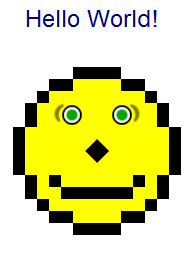 The ACID2 test renders perfectly. I’m not one for discussing the rights and wrongs of Google’s strategy, nor am I prepared to muse the future of the Internet. I have read many blog comments that another standards compliant browser will be the final nail in the coffin for IE. I disagree. Though people have turned away from IE to some extent with the advent of Firefox, I think that it’ll be mainly those in the know that will try Google’s browser. Though the trend appears to suggest that Internet Explorer is losing popularity, in the short term, I feel that Firefox users will try Chrome. I started this post using Chrome, and having got to this point, like it quite bit. For now, it’s only the lack of firebug that’s stopping me switch for good. I welcome the browser – competition is good. Surely I’m not the only one to recognise the similarity between the Chrome logo and Simple Simon, the memory game that I owned in the 80s. 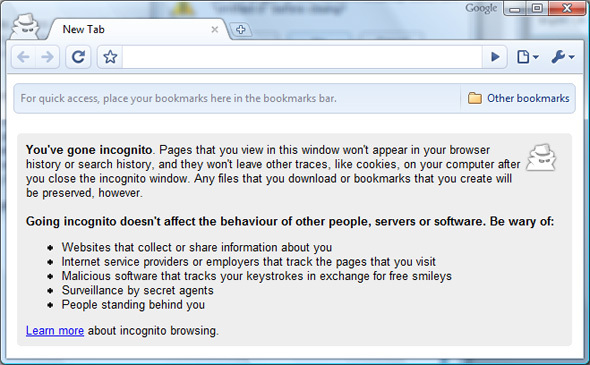 Hadn’t spotted the ‘incognito’ feature; very useful. Thanks for your comment on the PHP5 framework tutorial, by the way! My main gripe is that it means testing in yet another browser, as it doesn’t render pages exactly the same as Safari. I guess at the very least it’ll serve the same purpose as Opera: it’ll provide ideas for Firefox improvements and extensions.